Summer has arrived in full force, and totally caught me off guard. I'm still hoarding rhubarb from the market, all the while its already late June (WHAT?!). This month has been filled with weekend visitors, al fresco dining and ice cream. Lots of ice cream. We're heading to the lake this weekend, which can only mean loads of sangria and all things barbecued. I can't wait. To counter all this indulgence, I'm trying to keep weekday lunches and weeknight dinners light, healthy and packed with fresh produce. 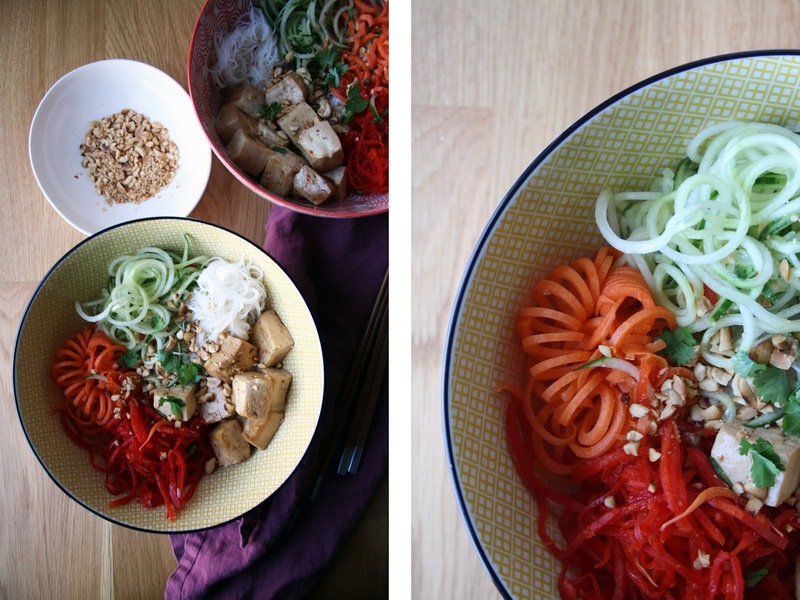 These vermicelli bowls are just that. They're the perfect balance between eating a bowl of raw veggies, and the comfort of rice noodles and warm baked tofu -- perfect for a working lunch, or a relaxing evening on the patio with a glass of vino. Many thanks to Danesco for hunting down the OXO tabletop spiralizer and sending it my way. Danesco is a Montreal-based distributor of high-end kitchen ware, including all things OXO. If you're in Canada, this is definitely a resource you're going to want to know about! 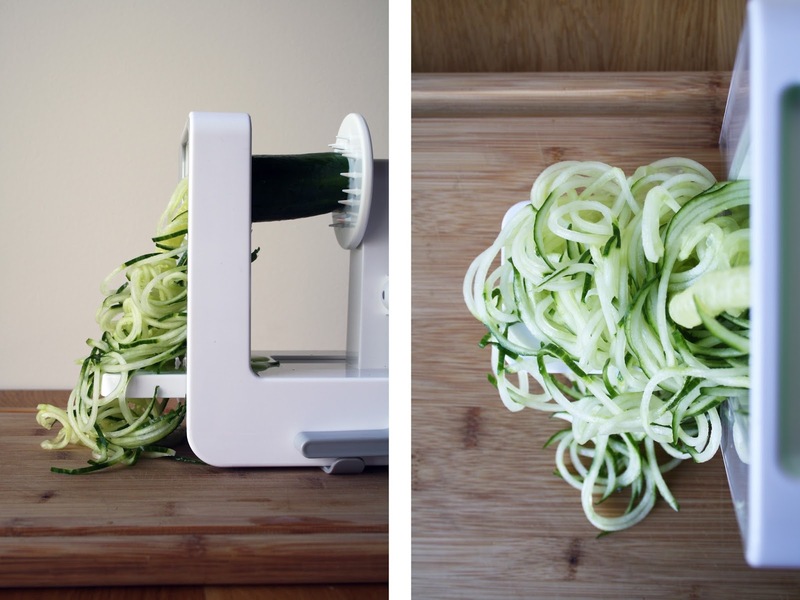 Don't sweat it if you don't have a spiralizer, simply julienne your veggies and you're good to go. We like the texture of semi-firm tofu the best, but if you're more into the firm kind, by all means, go with what you like. Don't skip the peanuts, they add the perfect crunch! Whisk the marinade ingredients in a square glass dish. 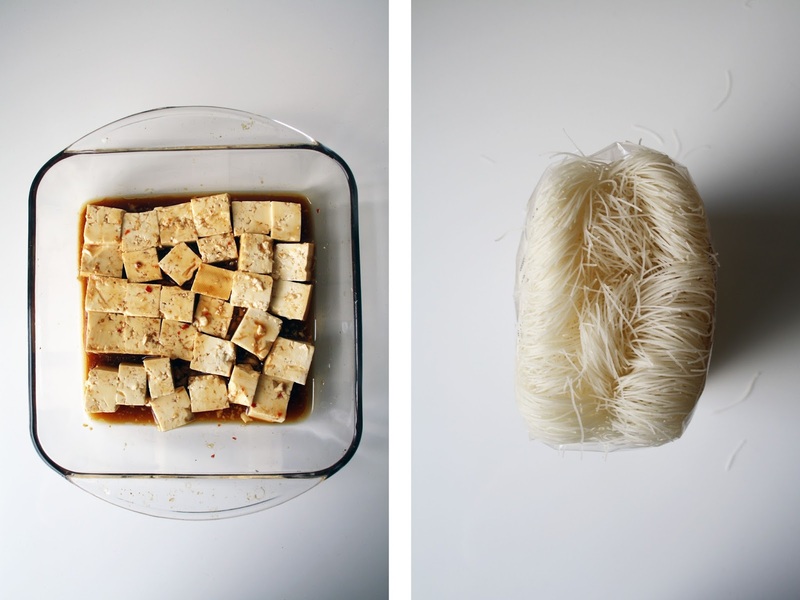 Place the cubed tofu into the sauce, and let marinate for 1 hour. Flip the tofu cubes halfway through. Preheat the oven to 475. Transfer the glass dish (with tofu and marinade) into the oven and bake for 20-25 minutes. 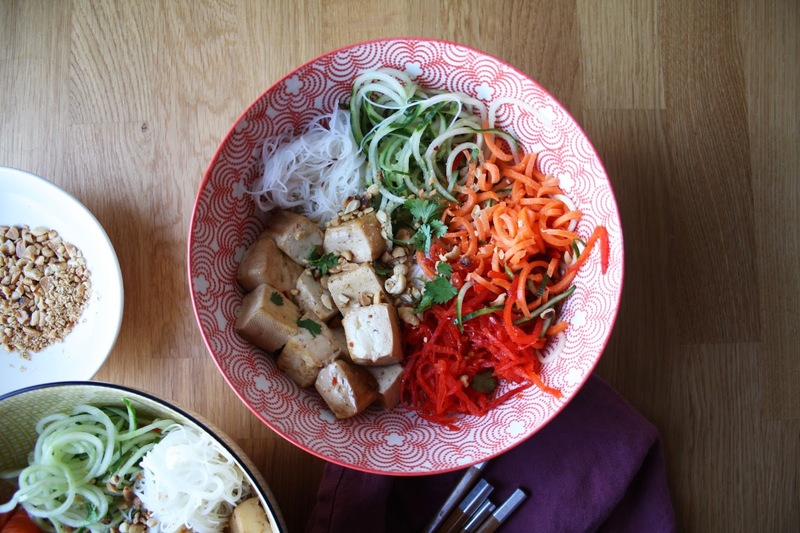 While the tofu is cooking, slice all your vegetables, using either a spiralizer, julienne peeler or knife. Whisk all the dressing ingredients into a glass jar and set aside. When the tofu is nearly ready, cook the rice noodles. To assemble, place a handful of noodles at the bottom of the bowl. 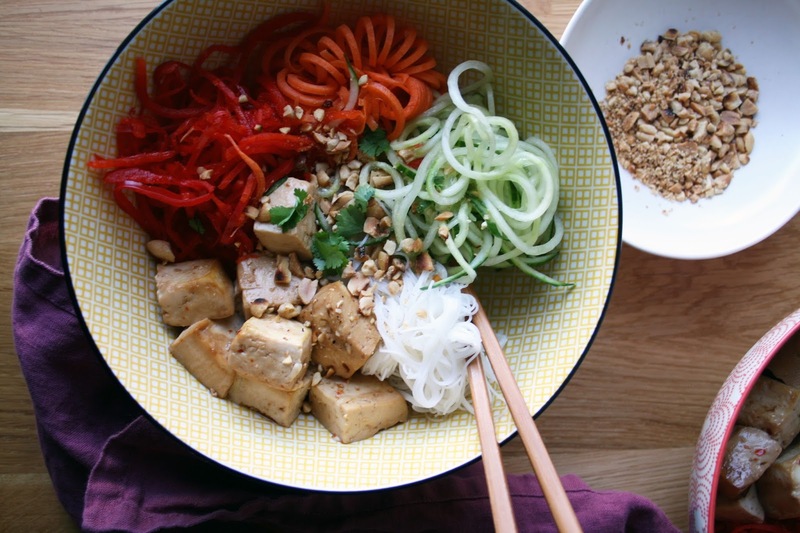 Top each bowl with half the sliced vegetables, a heaping spoonful of tofu*, toasted peanuts and cilantro. Drizzle the dressing, as well as some of the marinade, over top. Dig in and enjoy! * depending on how hungry you are, there may be leftover tofu.